Annet Gelink Gallery proudly presents the group exhibition Theatre Dreams of a Beautiful Afternoon with work by Yael Bartana, Ryan Gander and Meiro Koizumi. The exhibition focuses on monumental works of the three artists, and borrow its title from Koizumi’s work on view. Each piece in the show has a relationship with a certain city, whether it is the city of Amsterdam, Jerusalem or Tokyo. The chosen city serves not only as a backdrop but also as a stage upon which a narrative can unfold. These works go beyond the surface and reflect on the underlying reality. They do so by either zooming in on a detail or zooming out and taking a look from a distance. Koizumi’s four-channel video installation Theatre Dreams of a Beautiful Afternoon (2010-2014) at the first glance refers to something harmonious: the video begins by portraying passengers in a relaxed state of mind after a busy day in the confines of two metro trains. Gradually, the tension grows as a person cries and shouts, manipulating the situation from ordinary to painful. The piece focuses on the moment when a situation stet out of control, becomes embarrassing, breaks social rules or goes beyond one's emotional restraint. A sense of ambiguity is present as confusion is created as to whether this is a comment on the stressful nature of modern society or a comedy of broken communication – or actually both. Ryan Gander’s installation A Slowing of the Spectator's Eye (2005-2006) is composed of an accumulation of seemingly disparate components. 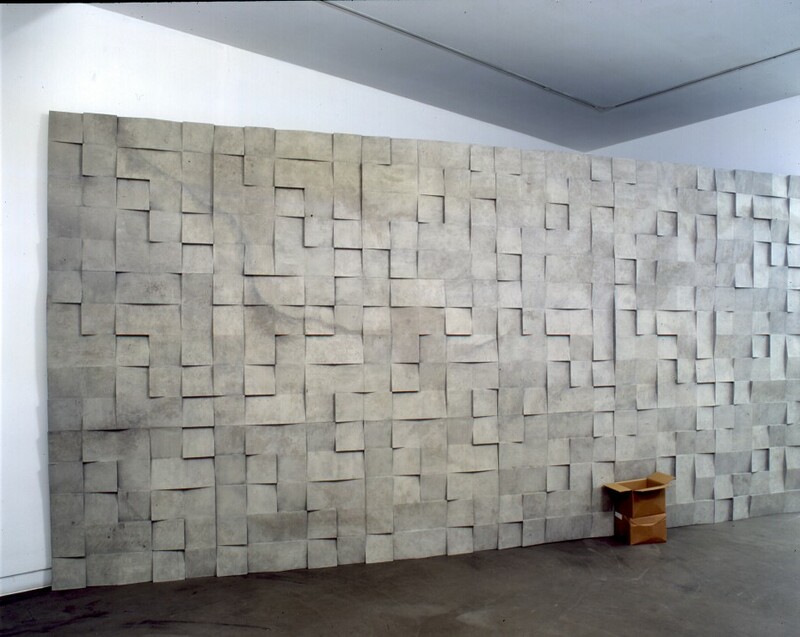 One wall of the exhibition space has been clad in what appears to be a patterned concrete relief, akin to what one would usually expect to find on the walls beneath a motorway underpass or on the exterior of a civic building designed and built in the 70's. It is in fact made from fiberglass and is colored and textured to look like a concrete cast. As a reconstruction of a facade, this fortification could not be more artificial. Next to the wall on the floor is Your Life in Three Acts (2005), a cardboard box filled with maps of Amsterdam’s city centre - commonly made freely available by the tourist information office. These are reproduced to include numerous streets that no longer exist, most of which mark locations where town planners have replaced the city's organic structure with a formulaic interpretation of 'civic economy’. Comic cosmology (2005), presented on a monitor opposite the mural sculpture, is an animation that features stars appropriated from the graphic logo for the World's Fair of 1964/1965 at Flushing Meadows, New York City. The globe which originally resided in the middle of the star formation is now removed: the stars circulate around an empty center.The sound track is by Elmer Bernstein, taken from the film 'IBM at the fair' by Charles and Ray Eames, 1964. Yael Bartana’s Simone the Hermetic (2015-2016)is an audio-visual installation ofthe city of Jerusalem. Imagine it's the year 3615. The world is marking the 1,600th anniversary of the birth of Simone the Hermetic. The viewer is invited to stand facing the Mount, to don headphones and to view an audio-visual simulation that recreates Jerusalem exactly as it was during the imaginary lifetime of Simone, in the year 2015. Through Yael Bartana's new sound installation, we will make our way through the streets and locations where Simone's journey began, and also where it probably ended – with the disaster of the molecular disintegration of the city. By zooming out and looking at the city in retrospect we are able to see and reflect on the mistakes and problems of this era.